The nebula’s distinct two lobes and S-shaped symmetry, with the two lobes appearing opposite each other and being similar in shape, are thought to be due to the presence of a binary companion to the nebula’s central white dwarf. The existence of the companion, however, has not been confirmed. The gas walls of the nebula’s lobes do not appear smooth, but are quite rippled, adding to the complexity of the Red Spider’s structure. 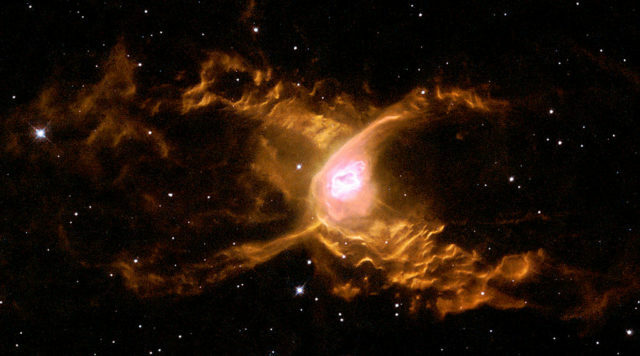 The distance of the Red Spider Nebula is hard to determine and has been estimated at 3,000 to 8,000 light years. The nebula’s diameter is estimated at 1.5 arcminutes but, with the distance unconfirmed, the diameter is also uncertain. The nebula is moving toward us at a speed of 17.3 km/s. The white dwarf – the dense, compact remnant of the star that ejected its outer layers to form the expanding, glowing nebula – generates an extremely powerful, hot wind, with an estimated temperature of about 10,000 K, which blows with a speed of 300 km/s. As a result, waves 100 billion km high are produced when the gas is compressed and heated, creating supersonic shocks. The stellar winds are responsible both for the nebula’s expansion and for its distinctive spider shape, while the atoms caught in the shock are responsible for the nebula’s glow in visible light. The red colour comes from hydrogen and ionized nitrogen emissions. The properties of the nebula’s central star are difficult to determine because the white dwarf is surrounded by a thick shell of dust. The star’s surface temperature is believed to be in the range of 150,000 to 250,000 K, but could be as high as 340,000 K or more, making it one of the hottest known white dwarfs. 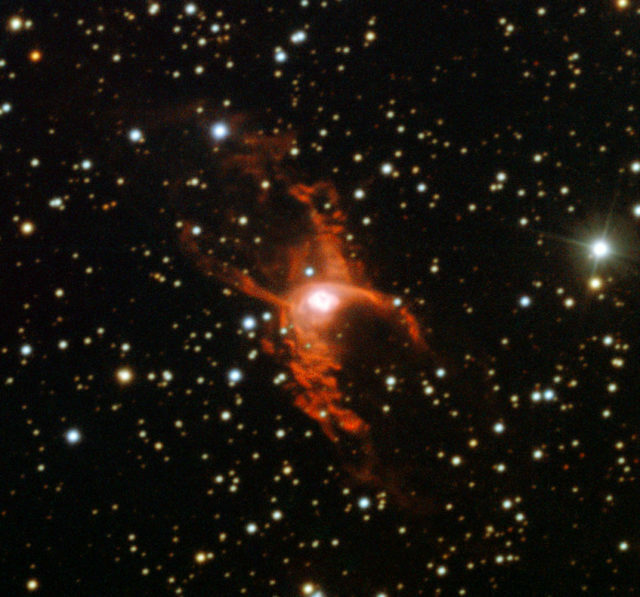 The Red Spider Nebula is very hard to see because the interstellar and circumstellar dust makes it about 40 times dimmer than it would be if it were located in an area with no dust. The nebula lies in the northwestern part of Sagittarius, only 10 degrees to the north-northeast of the centre of the Milky Way. 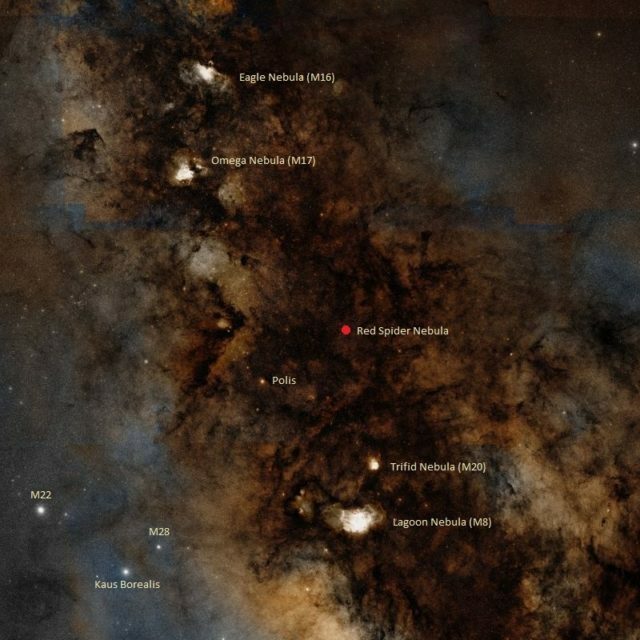 It can be found 2.4 degrees northwest of the star Mu Sagittarii, a multiple star system known by its traditional name, Polis, which is located just above the celestial Teapot. The nebula is situated in the same area of the sky as the much larger, brighter and better known Eagle Nebula (Messier 16), Omega Nebula (Messier 17), Trifid Nebula (Messier 20), and Lagoon Nebula (Messier 8).